A MAJOR drawcard for the new $42 million East Shores redevelopment is quickly taking shape. The concrete pour for the state-of-the-art water play park was recently undertaken, cementing in place the pipes and supporting infrastructure, which will create a fun, wet play area for kids of all ages. The new community precinct is now 50% complete with the next phase of development involving the completion of above-ground facilities and landscaping of the new parklands. The Gladstone Coal Exporters Maritime Precinct is on its way to being a world-class esplanade for residents and visitors to enjoy. After a year of below ground level and structural work, the installation of key infrastructure including the water play park, shade structures and public amenities is now visible. The waterfront boardwalk and viewing platform are also taking shape and will offer the ideal vantage point to enjoy Auckland Creek and the entrance to the marina. Stage one of the project also involves the relocation of historical artefacts from Gladstone's Maritime Museum, including navigational buoys, anchors and bollards from the old Auckland Point Wharf. 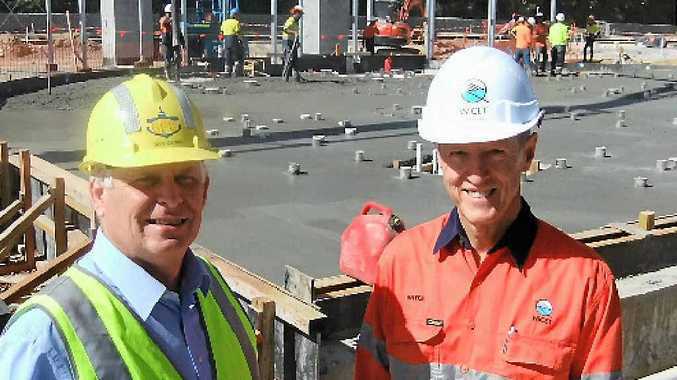 Wiggins Island Coal Export Terminal is contributing $35 million toward the waterfront project while Gladstone Ports Corporation has contributed the site and a further $7 million, is the project developer/manager, and will operate the precinct once completed.